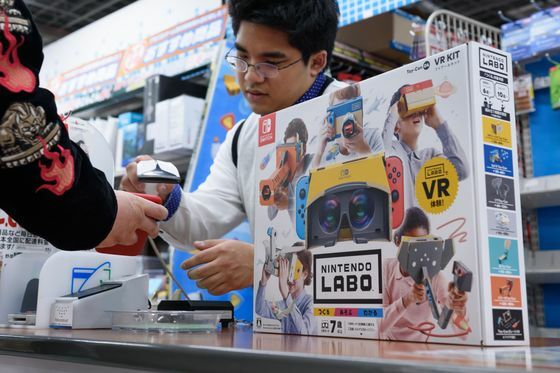 (Bloomberg) -- A quarter-century after its disastrous first foray into virtual reality, Nintendo Co. has returned to the technology with an affordable headset that has potential for bigger things. 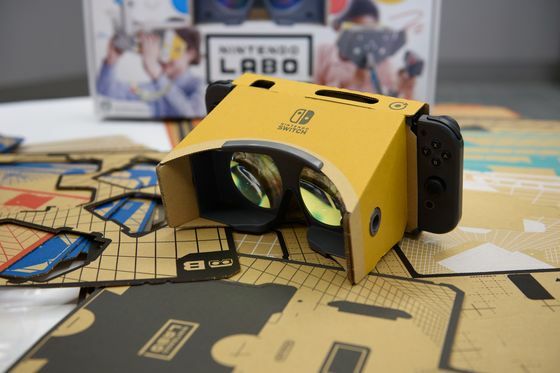 The Labo VR Kit, which went on sale Friday and starts at $40, is a build-it-yourself set of cardboard goggles and controllers for Nintendo’s Switch console. The VR system has been carefully designed to work within the limits of the Switch’s processing power, and to minimize the chances of making players dizzy or sick. Its simplistic "mini-games" seem aimed primarily at casual gamers, particularly parents with youngish kids, who might want to try VR without dropping the many hundreds of dollars that more advanced systems like Facebook Inc.’s Oculus Rift can cost. If the VR kit sells, it could help enhance Nintendo’s games lineup without the company having to produce a bunch of new hits. Last week’s announcement that popular games Super Mario Odyssey and The Legend of Zelda: Breath of the Wild will be compatible with the cardboard headset generated more buzz than the headset’s original unveiling and pushed shares to a two-month high. But Nintendo knows the Switch isn’t the ideal VR hardware. That’s why each mini-game in the Labo VR Kit is designed to be played at most for 5 to 10 minutes. The company has also opted against including a headset strap, meaning players are forced to hold the goggles up to their eyes. That also helps discourage using the system in anything other than short bursts, and encourages friends to pass it around. Nintendo’s return to VR comes as a surprise after years of executives dismissing the technology as difficult to design games for or questionably safe. "When I see people play virtual reality, it makes me worry," legendary game designer and senior executive Shigeru Miyamoto told Time two years ago. The company had reason to be skeptical. The Virtual Boy, its disastrous first attempt at a VR headset, flopped with gamers in 1995 due to lousy graphics, boring games, risks of nausea, and even worries over brain damage. Nintendo experimented with another VR product for its GameCube console a decade later, but ultimately shelved it. The biggest test will come in two weeks time, when the Mario and Zelda games will be updated for compatibility with the VR Kit. If Nintendo can succeed in adapting those hits for VR, it instantly gives the company one of the strongest software lineups of any VR headset. Beyond Mario Kart, other titles that are well suited for VR include the latest entries in the Star Fox and Mario Party series.